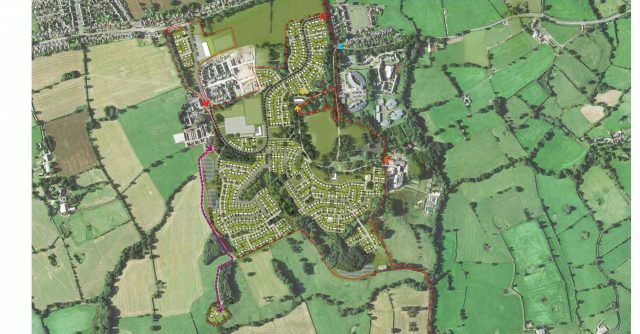 The Tibbalds CampbellReith JV and Homes England are proud to announce the submission of a new, updated Outline Planning Application for the proposed redevelopment of the former Whittingham Hospital site off Whittingham Lane in Preston. The former psychiatric hospital site has been subject to many previous attempts to promote redevelopment. Following acquisition by Homes England in 2005 and development of an initial phase of 150 dwellings by Taylor Wimpey (currently under construction), redevelopment of the site has stalled for a number of technical reasons and viability issues and has remained undeveloped for many years. The Tibbalds CampbellReith JV was appointed by Homes England in December 2017 to review historic work and develop a new Masterplan that could overcome these issues and would enable development to be delivered over a number of phases with various development partners. Submission of the Outline Application is the culmination of 15 months of intensive work by a truly multi-disciplinary team, led by CampbellReith’s Manchester office. The team, comprising Barton Willmore, the Vinden Partnership, The Environment Partnership, Prime Transport, Tuffin Ferraby Taylor, Jones Lang LaSalle and SRL Technical Services, have worked closely together and consulted extensively with key stakeholders, including Preston City Council, the NHS, local residents and the Whittingham Sports & Social Club (who are present on the site). The outcome has been an inclusive and deliverable Masterplan that Homes England and the team believe now meets the needs and requirements of the local community and will allow redevelopment of the long-stagnated site to proceed. The Masterplan proposes the redevelopment of the 49 hectare site for up to 750 dwellings, including redevelopment of the existing Whittingham & Goosnargh Sports & Social Club with a new club house and car park, retention of an existing bowling green, provision of a new football pitch, tennis court, multi-use games area and event space. The Application also provides land for the future delivery of a local primary school and includes the Grade II Listed St. John’s Church, with the potential for future conversion to residential use. The Sports & Social Club facilities, located towards the centre of the site, will provide a focal point for the local community and allow access to sports and recreational facilities within easy reach and via sustainable modes of transport. A key theme of the Masterplan was to retain as much existing high-value woodland and vegetation as possible and over 22 hectares of green infrastructure have therefore been included to provide a multifunctional network of green spaces that permeate through the development. The entire team are proud to have been able to work with Homes England on this prestigious project and will continue to provide support both during the Planning process and beyond to disposal. For further information on the joint venture and the wider team please see the Tibbalds CampbellReith JV website.